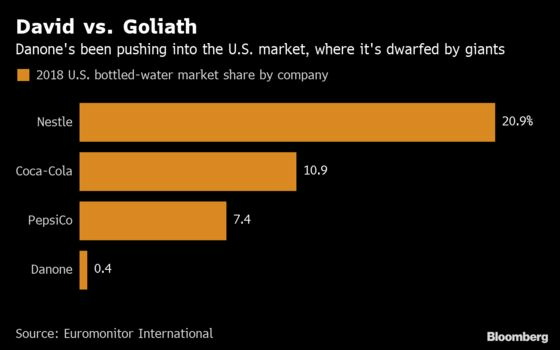 (Bloomberg) -- Danone is laying down a challenge in an already competitive U.S. bottled water market as it seeks to bring more of France’s Evian to Americans. The French company’s bottled-water sales rose 3.9 percent in the first quarter, spurred by Evian’s performance in North America. To keep growth coming and help offset Danone’s sluggish yogurt business, Evian teamed up with Keurig Dr Pepper Inc. with a distribution agreement in October that’s helped put more of its bottles into U.S. convenience stores. Evian has been trying to gain recognition in the U.S. with ads featuring tennis players Maria Sharapova and Madison Keys as well as actor Luka Sabbat, abandoning a decade of advertisements that featured dancing and rollerskating babies. The company also had a tie-up with Walt Disney Co. for the 90th anniversary of Mickey Mouse last year, and has been expanding with Evian facial water spray in pressurized canisters. The brand recorded fourth-quarter sales growth of more than 20 percent growth in North America, and Chief Financial Officer Cecile Cabanis said sales kept rising strongly in the start of this year. As an increasing number of consumers ditch soda for water amid health concerns, big beverage companies like Coca-Cola Co. and PepsiCo Inc. have shifted a big part of their resources to bolster bottled water brands. Pepsi even paid $3.2 billion for fizzy-drinks dispenser SodaStream International Ltd. last year. 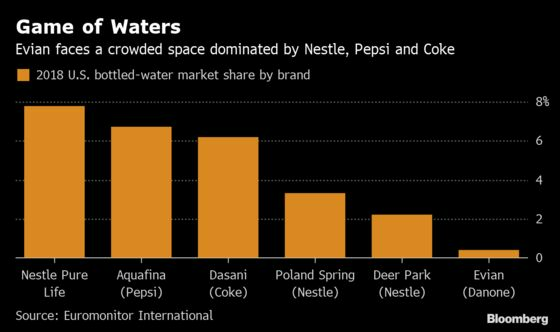 Market leader Nestle SA, meanwhile, reported a drop in volume at its water business last year, weighed down by higher input costs like packaging and distribution in the U.S.
Evian has lagged in the U.S. bottled-water market, where Euromonitor says it’s only the 17th top brand. Danone used to have a contract with Coca-Cola to distribute Evian water in that market, but it ended several years ago. Danone’s total first-quarter revenue climbed 0.8 percent on a like-for-like basis, the Paris-based company also said Wednesday. The company reiterated its full-year guidance for like-for-like sales growth of about 3 percent, adding growth will accelerate from the second quarter. Danone aims for 4 percent to 5 percent growth next year.